I love this caterpillar. I wish that more than one had survived from the eggs the mother laid, so I could preserve one as a voucher. I was considering preserving this one, but today I noticed it was beginning to pupate in the bottom of its container. I guess I will wait for it to emerge as an adult. Oh right, Texas! It already feels like so long ago, we’ve been so busy here in the lab. 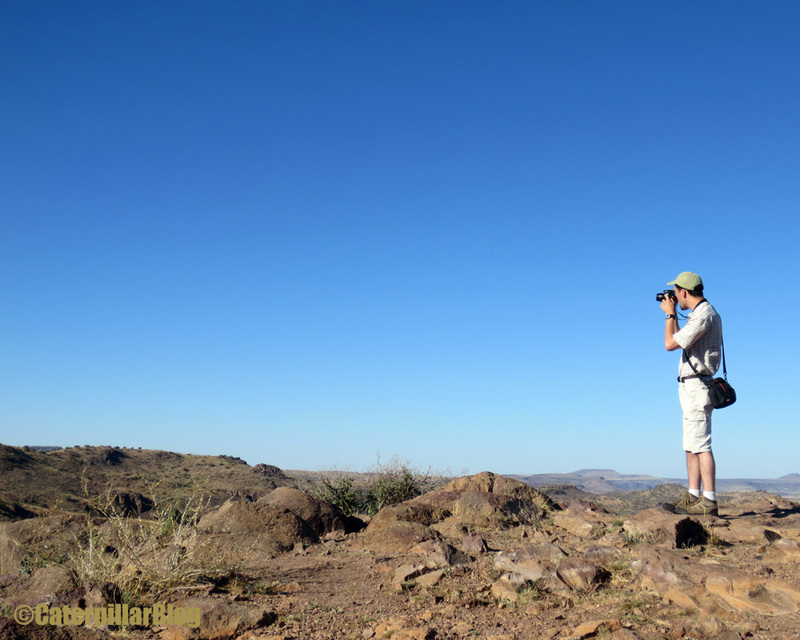 Our second stop in Texas was Davis Mountains State Park, in Fort Davis. It was another long drive across flat, desert-like land. We saw several hundred (thousand?) wind mills, which created a very eerie landscape. Fort Davis provided an emotional refuge of mountains and trees. We arrived late afternoon, and promptly went for a hike to stretch our legs. The sky was very blue. Everyone we had talked to said that west Texas was experiencing a several-year-long drought. When we arrived at the park, it became quite clear they were telling the truth. Trees were clinging to old, tough leaves. Grasses were brown and crunchy underfoot. Wildlife seemed scarce. Aside from a couple whiptail lizards, a ground snake, and some unruly javelinas, the landscape seemed eerily deserted. By the time we set up camp and settled in it was getting dark, so we set up a blacklight. Not much came in other than micro-moths and midges. Disappointed, we hoped the next day would be more fruitful. In the morning we got up early for some caterpillar hunting. Well, I went for a run and a workout first, but then we armed ourselves with beating sheets and sticks and began wandering around the campground. There were only a few other people in the park, so the park staff didn’t mind. One of the many geometrid caterpillars. Abilene sure was lush in comparison! But we did not give up hope, and searched as many branches as we could reach. Each tap of a tree branch released plumes of dust, pollen, and dead leaves. 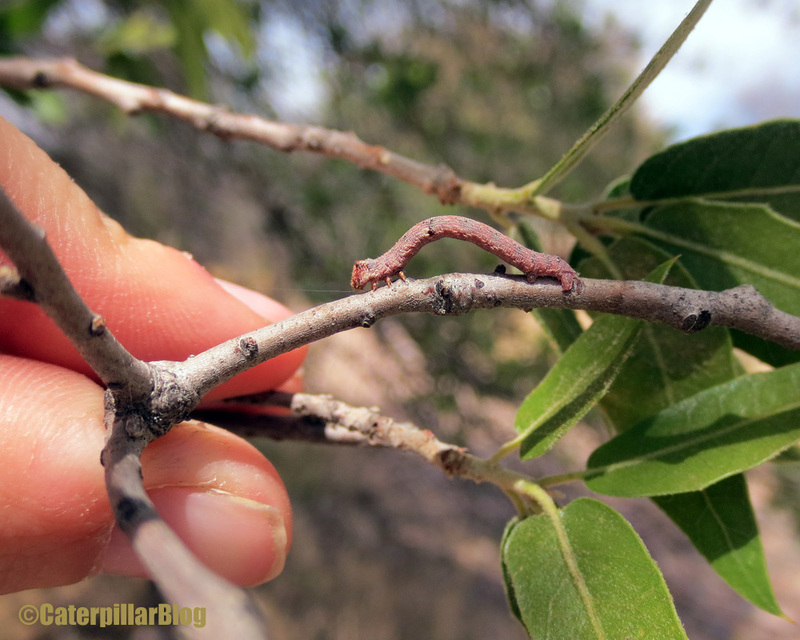 Surprisingly, we found a bunch of geometrid caterpillars. I wonder why they were the most abundant? After an hour of not-very-productive searching, Ben shouted “Brigette, I have a present for you!”. 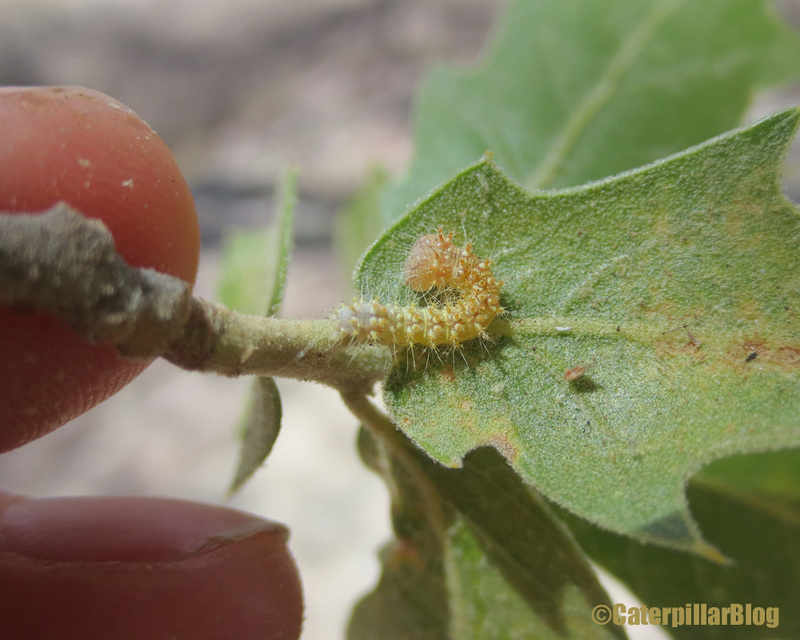 Sure enough it was a little Acronicta caterpillar on an Emory oak tree! Despite our renewed enthusiasm and re-doubled efforts, we did not find any more Acronicta in the park. 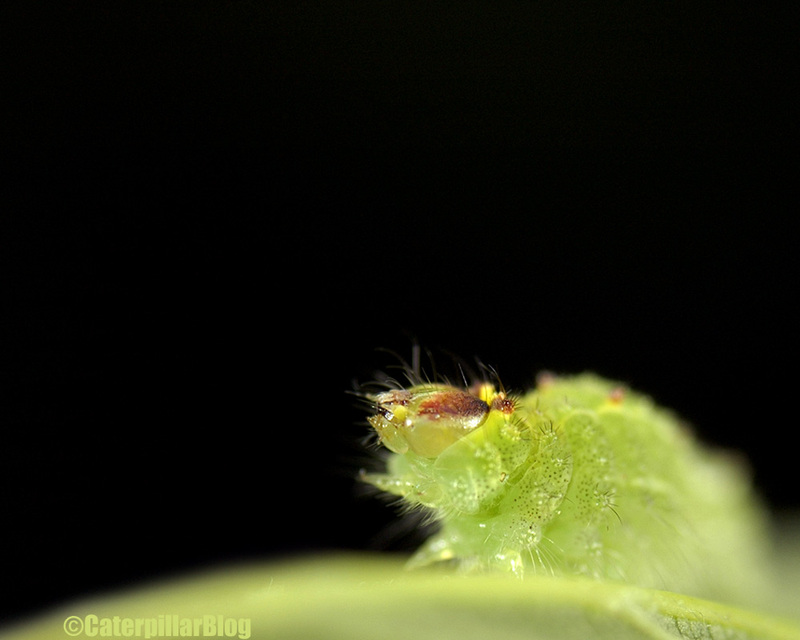 This little caterpillar grew up to be quite interesting – it’s the one featured in this post. 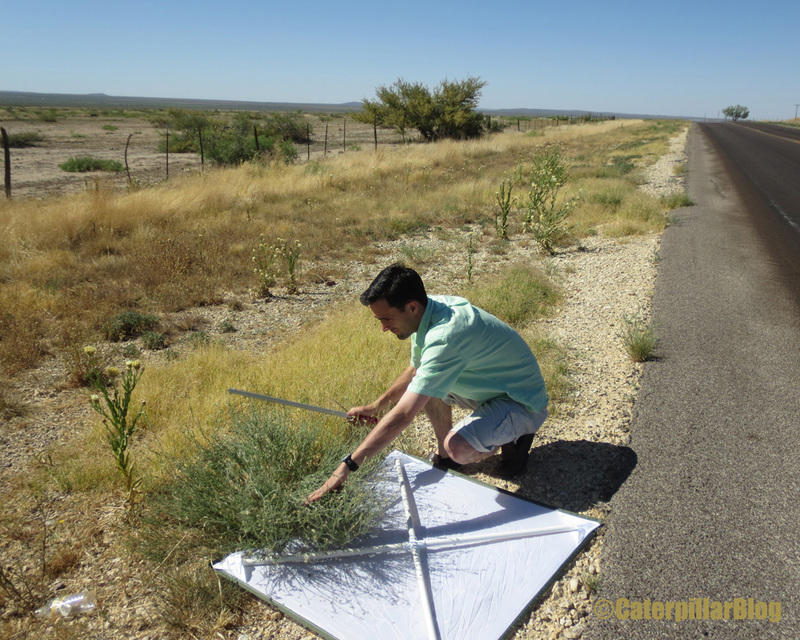 After a quick lunch (which became our classic: gluten free wrap with sliced turkey and a dill pickle) we drove a few miles down the road to the Chihuahuan Desert Nature Center. A place so wonderful it deserves its own post, coming soon! There are caterpillars called “slug caterpillars” due to their, well, slug-like appearance. They are the Limacodidae, and they are some of the most beautiful and bizarre caterpillars out there. Not to be outdone, there are a few species in the genus I’m studying, Acronicta, which resemble the infamous slug caterpillars. Blobby green things that hide their heads while at rest. If slugs were green and had little spikes all over. These caterpillars were raised from eggs laid by a few females I captured in Boerne, Texas. I am uncertain whether they are Acronicta vinnula (common throughout the eastern US) or Acronicta lepetita (native to southern Texas, and so closely resembles A. vinnula that I am unsure how to tell them apart). 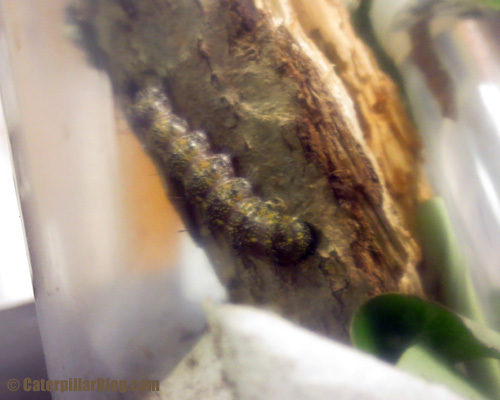 As far as I can tell, the caterpillars are identical to the A. vinnula I have raised in the past. It appears that no-one has raised A. lepetita before. Someone please correct me if I am wrong. I like to imagine this is the caterpillar’s “lion roar”. The most information I can find is that “the larvae feed on various plants”. Thanks Wikipedia, that’s quite helpful. What might be more helpful is a look at the adult. Here is one of the mothers. I’ll throw this one out to you again. What do you think? 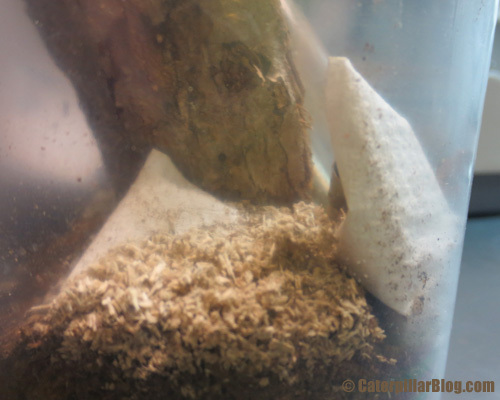 Joe Acronicta had had enough of us poking and prodding him, and decided to pupate. I know that most Acronicta species pupate by tunneling into soft, dead wood. But usually this is a shallow groove, covered by bits of wood and silk. Sometimes they burrow in deeper, but you can see the hole behind them. Joe decided to be a bit like some other Acronictines (species in different genera, but still closely related to Acronicta). 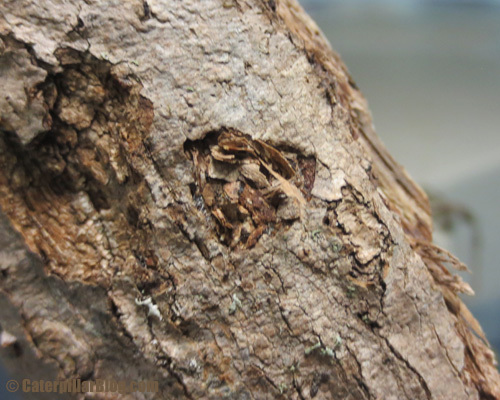 Genera like Comachara, Polygrammate, and Harrisimemna all dig deep tunnels into wood. Then they crawl out and back into the tunnel rear-end first, sealing up the entrance with silk and bits of wood. That’s exactly what Joe did. Joe, diligently digging his tunnel. The pile of chewed wood left behind. I’m not sure how long it will be before he emerges, maybe a few weeks or months? 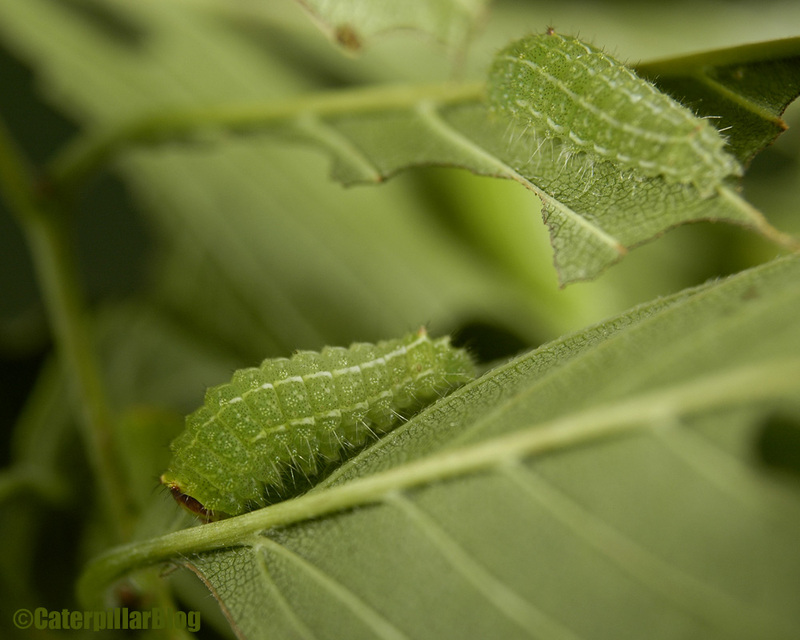 When caterpillars pupate early in the season, it usually (but not always) means they will emerge in time to start another brood before cold weather arrives. 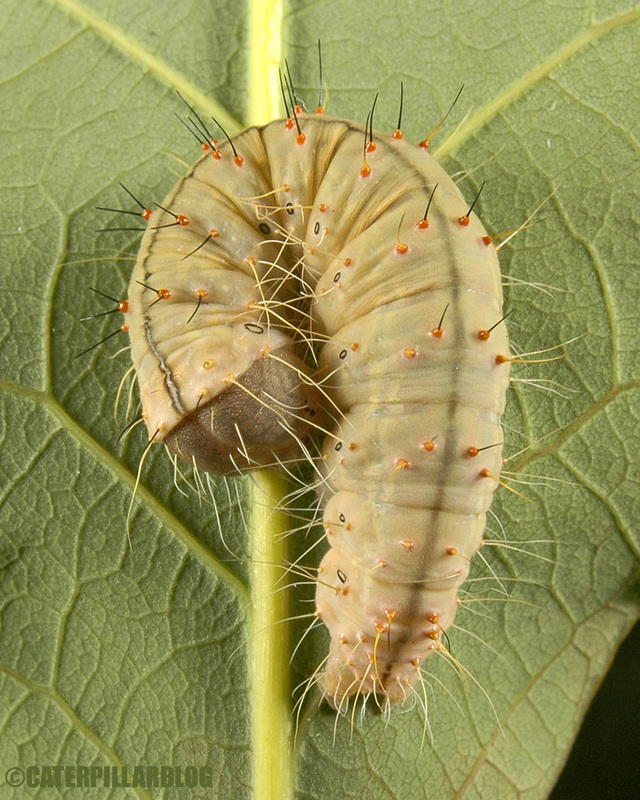 If they pupate late in the season, they will usually (but not always) overwinter as a pupa. While we are pretty sure that we have these caterpillars matched up with the correct adult, we are excited to have an adult emerge so we are 100% sure. I’ll post pictures when Joe makes his appearance as a moth! 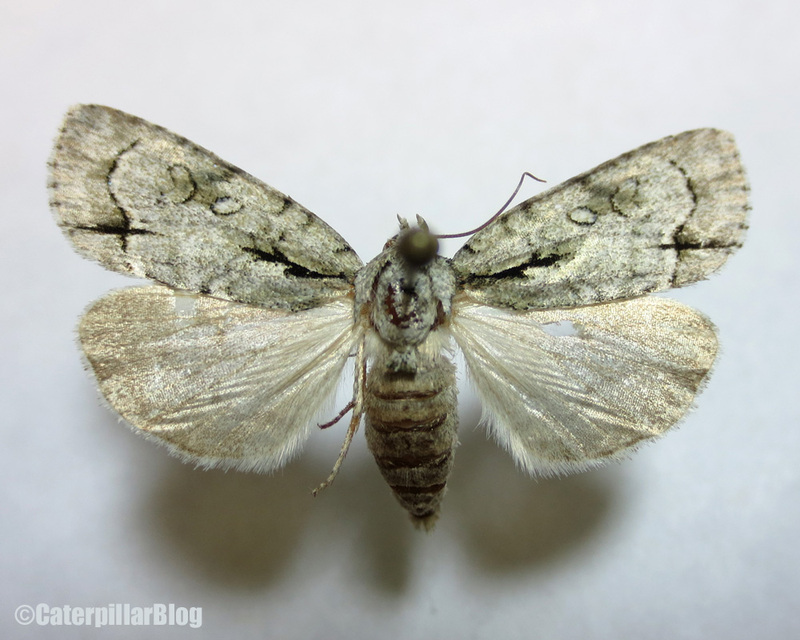 We recently received a new friend from Texas – nicknamed “Joe Acronicta” by the collaborator who sent him to us. This is one of my favorite species – Acronicta atristrigatus, also known as the “Paddlemaster”. I bet you can guess why. What we’re all wondering, though, is what those paddles are for. They appear on several Acronicta species, but in different arrangements. Some only have them in place of the dorsal setae, while others are nearly covered in paddles. 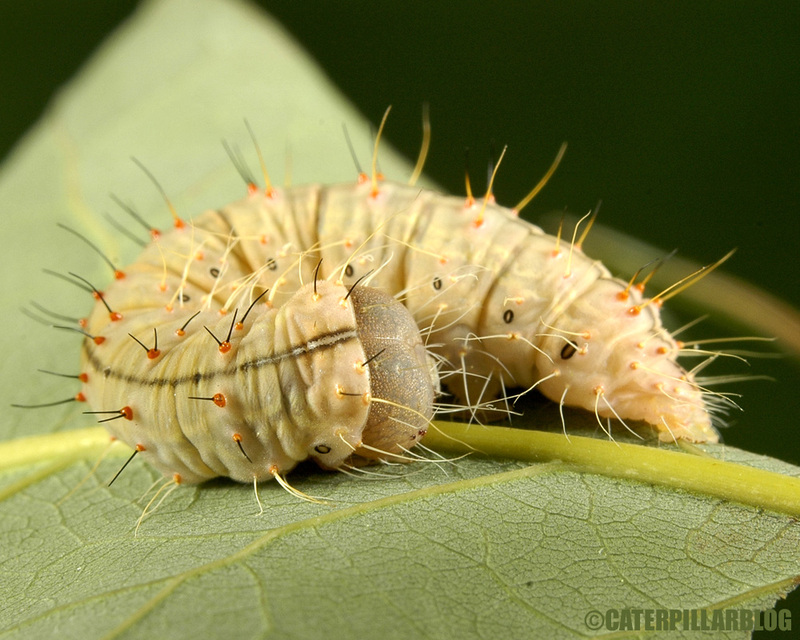 I have a feeling they are used to thwart parasitoids which may try to land on the caterpillar to lay their eggs. 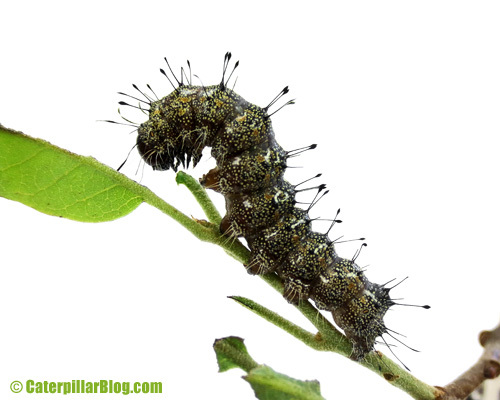 Many species of flies and wasps see caterpillars as big tasty meals for their offspring. I imagine all those hairs would make it difficult for a parasitoid to land. And if it does, the caterpillar will surely notice. These guys also have some interesting defensive behaviors. Don’t worry, I did not hurt the caterpillar! Like most Acronicta species, it starts with a bite (or attempted bite). But instead of simply returning to its perch, the caterpillar begins to sway side to side. We are all curious as to whether this serves to deter birds, or parasitoids, or perhaps the caterpillar is trying to sway gently like a tree branch?